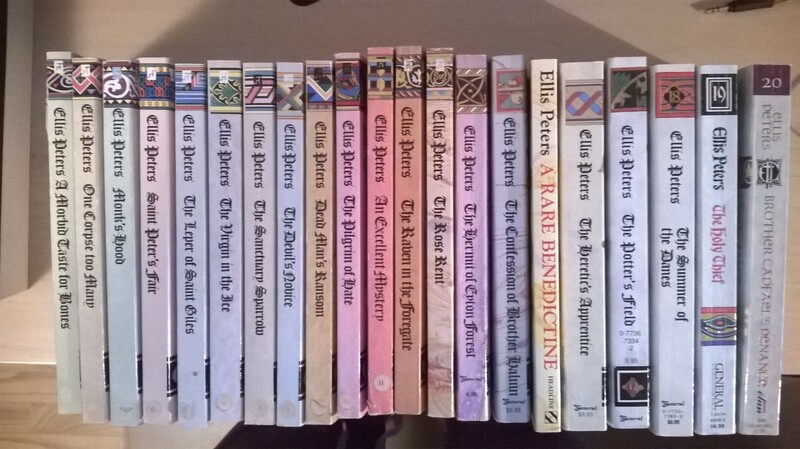 Thanks to the generosity of a retired colleague who is pruning her book collection, I recently came into possession of not one, not two, but all twenty-one of Ellis Peters’s Brother Cadfael mysteries. This series has long been on my radar, as it is beloved of many of my reading buddies including Colleen (formerly of Bookphilia, now of Jam and Idleness) and Steve (of Stevereads, of course!). I have made a couple of gestures towards it in the past, getting one or two from the library, but never actually read any. Who knows why: the timing just wasn’t right. But if this gift wasn’t a sign, I’m not a mediæval Welshman. OK, so I’m not, but Cadfael is, and now that we’ve met at last I recognize his charm, and the charm, too, of the world and the style Peters creates for her readers. The cover describes A Morbid Taste for Bones as “a mediæval whodunnit,” and it is a lot closer to the puzzle form than the denser, more character-driven mysteries I typically choose for my own leisure reading (I never read Agatha Christie except for teaching, and I eschew the endless pageant of her “cozy” successors). I also don’t tend to like historical mysteries, which (like a lot of historical fiction generally) often strikes me, fairly or not, as either facile or encumbered with its research. (I accept George Eliot’s judgment that good historical fiction requires “the rarest concurrence of acquirement with genius.”) Peters deftly triumphed over my prejudices, though: the abundant research obviously required to present Cadfael’s world in such detail — from herbal remedies to weaponry to burial rites — is deployed very naturally into elegant descriptions of setting and character, with more complex social or cultural contexts explained through natural devices such as Cadfael’s need, as a Welshman, to interpret or observe differences in custom between his countrymen and his Saxon colleagues. The wood ridge on either hand ran in oblique folds, richly green, hiding the scattered house-steads. The fields were already planted, and here and there orchards flowered. Below them, where the woods drew back to leave an amphitheatre of green, there was a small stone church, whitewashed and shimmering, and a little wooden house beside it. It bodes well for the rest of the series that I particularly liked Cadfael himself, especially his desire to work out a solution that satisfies justice without undue vengefulness and that also does as much good to as many people as possible. His benevolence doesn’t feel saccharine, because of his pragmatism and the ruthless wiliness of his schemes to uncover the evildoers. He’s also wry and uncompromising in his judgments of his fellow man, and I expect his dislike of men who use religion to serve their personal ends will be an ongoing theme. I was particularly interested to see how Peters would deal with religion. All things supernatural are verboten in the puzzle mystery proper, of course. In their own ways, though, all the characters in A Morbid Taste for Bones are believers, and some of what they believe is explicitly supernatural (for instance, that the murder victim will bleed afresh if touched by his murderer). I thought Peters did a nice job conveying the centrality of her characters’ beliefs to their lives and to the ways they interpret the things that happen to them, even as she and Cadfael approach the crime itself as one committed by human hands for human reasons, and solvable by human reason and ingenuity. Brother Cadfael himself is quite prepared to believe in miracles, but it’s his intervention, not God’s, that reveals whodunit. At the same time, there’s just a hint that he and his collaborators may have been helped, or served, by the Saint whose bones are at issue in the plot. We don’t have to believe that, but it makes sense that Cadfael would be willing to, and so in that way Peters gets to have her mystical cake and eat it too. I’m not going to binge read the rest of the series, since I have a lot of other books I’m keen to get to, but having sampled it at last, I’m happy knowing the rest of them are there waiting for me. Fall term is coming, and with it a lot of busy, stressful days when a little time with Cadfael will feel like a perfect time out. A long time ago, it must be over 20 years, I read probably the majority of the Brother Cadfael mysteries, obviously, because I loved them, otherwise why so many! I remember the first five or so as being the strongest, but what kept me reading was, yes, as you so eloquently describe here, Brother Cadfael’s wisdom, humour, sense of right and justice, keen intelligence, and the atmosphere of time and place the books imparted. The actual crimes meld together but, like most beloved mystery series, the central crime solver and his ways of thinking and doing remain. I hope you enjoy the rest: they are great for a winter evening. I agree that the central character always becomes the force that sustains a long-running series. So far I don’t see anyone who will be his ‘sidekick’ – I thought it might be Brother John but we left him behind in Wales. I guess I’ll find out. I thought of you immediately when I saw these. I will definitely watch the series eventually too, not least for Derek Jacobi — speaking of whom, have you watched any of Last Tango in Halifax? (It’s the other Halifax, not ours.) He’s awfully sweet in that. I caught my breath as I read your first sentence. You are a very lucky lady! I have the first few books and one farther down the line. I have borrowed these books from the library over the past 20 years of my life, but I doubt that i have read them all. The TV series was very good too. Hmm, maybe time to watch them again! I am lucky, aren’t I? I didn’t know what to expect when I went to unpack the boxes, but it was a treasure trove thanks to which I have now completed my existing partial runs of Elizabeth George, P. D. James, Amanda Cross, Sara Paretsky, AND Sue Grafton, too. I loved the early books in this series but found that the later ones became very predictable. Round about page fifty you would be introduced to a menial character who seems to have no real purpose in the narrative. He or she ‘did’ it – even if it hasn’t been done yet. By the time she wrote the last novels Peters was very ill so perhaps I should be more forgiving, but by that stage I was reading them just for Cadfael (who doesn’t look anything like Derek Jacobi in my imagination) rather than for the plot. I suppose it’s not surprising that a series might fall off to the point that loyalty to the detective is what keeps you going. It’s the paradox of a successful formula, isn’t it, that what is comforting is precisely the predictability, but what’s predictable can also get boring. I think that’s why I do generally prefer a different kind of mystery, one that’s deeper and more expansive. Though there too, as some recent experiences with Elizabeth George and even P. D. James have reminded me, the virtues can become vices (prolixity, sententiousness). I don’t know if you’ve got onto it yet, but may I recommend the next book, ‘One Corpse Too Many’? Much as I love the whole series ‘Once Corpse Too Many’ is still one of my favourite re-reads. The first time I read it (well over 20 years ago!) I was nearing the end of the book on a bus journey home when the bus reached my stop. I was so gripped by the drama I promptly sat down at the bus stop to finish the book before finishing my journey home. Drama aside, though, the book has some lovely and very likeable characters and scenes which is really why I love it. Incidentally, while Cadfael is made up, Abbot Heribert and Prior Robert really existed and can be found in the history of Shrewsbury Abbey.